Small metastases to the lung can escape detection by CT scan but can still be by identified by palpation during surgery. Minimally invasive metastasectomy by video-assisted thoracic surgery (VATS) is effective in removing nodules identified preoperatively, but prevents palpation of the lung. Although theoretically this may lead to a higher recurrence rate, this assumption has not been formally tested. Long-term survival and recurrence after VATS metastasectomy and open metastasectomy were analyzed retrospectively at a single institution between 1993 and 2004. Data were analyzed with univariate and bivariate analysis, Kaplan-Meier survival estimates, and proportional hazard models. A total of 330 patients (age 55.8+15, 49% female) underwent VATS (58%) or open metastasectomy. The mean number of nodules was 2.1 (1-20) and the mean nodule size was 2.3cm (0.1-15cm). Pathology included 59% carcinoma, 27% sarcoma, 6% germ cell, 6% melanoma, and 1.5% others. Eighty percent of patients underwent wedge resections and 20% underwent anatomic resection (segmentectomy, lobectomy, pneumonectomy). 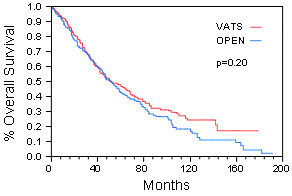 VATS metastasectomy was associated with a median overall survival and disease-free survival of 52 and 60 months, compared with 58 and 56 months for open metastasectomy. There was no difference in survival for VATS or open approaches after adjusting for age and type of resection. Median overall survival and DFS were 61 and 60 months after wedge resections and 53 and 55 months after anatomic resections, respectively. The VATS approach to pulmonary metastasectomy provides similar long-term and disease-free survival as the traditional open approach and wedge resection is equivalent to anatomic resection for these outcomes.